Images of History | I hope to be remembered for my atrocities! 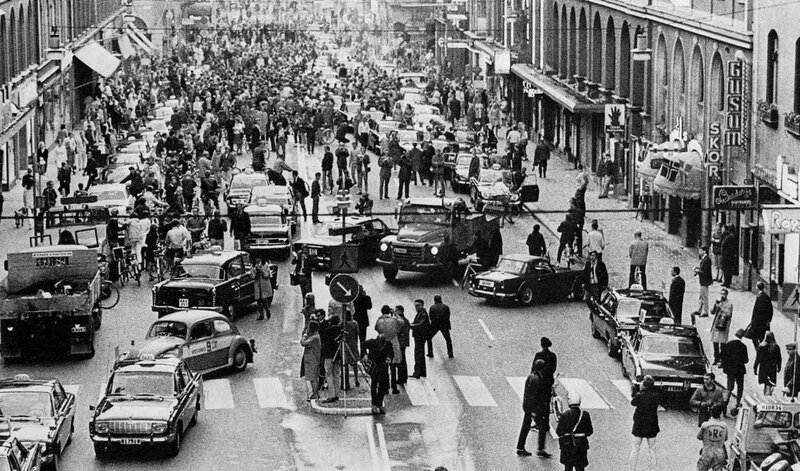 Dagen H (H day), today usually called “Högertrafikomläggningen” (“The right-hand traffic diversion”), was the day on 3 September 1967, in which the traffic in Sweden switched from driving on the left-hand side of the road to the right. The “H” stands for “Högertrafik”, the Swedish word for “right traffic”. It was by far the largest logistical event in Sweden’s history. All of Sweden’s neighbours (including Norway and Finland, with which Sweden has land borders) drove on the right, with 5 million vehicles crossing those borders annually. Approximately 90 percent of Swedes drove left-hand drive (LHD) vehicles. This led to many head-on collisions when passing on narrow two-lane highways, which were common in Sweden due to the fact that the country’s low population density and traffic levels made road-building expensive in per capita terms. City buses were among the very few vehicles that conformed to the normal opposite-steering wheel rule, being left-hand drive. However, the change was widely unpopular; in a 1955 referendum, 83 percent voted to keep driving on the left. 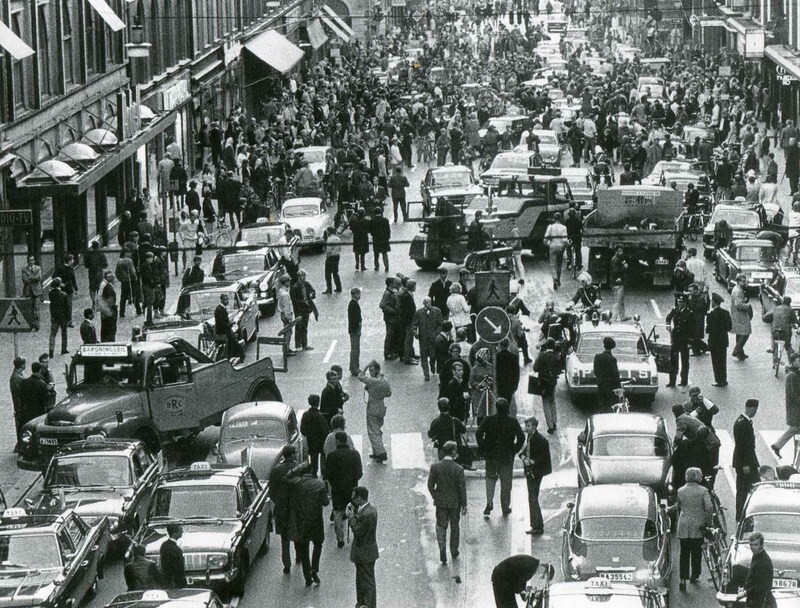 Nevertheless, on May 10, 1963, the Swedish Parliament (Riksdagen) approved the Prime Minister Tage Erlander‘s government proposal of an introduction of right hand traffic in 1967, as the number of cars on the road tripled from 500,000 to 1.5 million, and was expected to reach 2.8 million by 1975. A body known as Statens Högertrafikkommission (HTK) (“the state right-hand traffic commission”) was established to oversee the changeover. It also began implementing a four-year education programme, with the advice of psychologists. The campaign included displaying the Dagen H logo on various commemorative items, including milk cartons and underwear. Swedish television held a contest for songs about the change; the winning entry was “Håll dig till höger, Svensson” (‘Keep to the right, Svensson‘) written by Expressen journalist by Peter Himmelstrand and performed by The Telstars. As Dagen H neared, every intersection was equipped with an extra set of poles and traffic signals wrapped in black plastic. Workers roamed the streets early in the morning on Dagen H to remove the plastic. Similarly, a parallel set of lines were painted on the roads with white paint, then covered with black tape. Before Dagen H, Swedish roads had used yellow lines. On Dagen H, Sunday, 3 September, all non-essential traffic was banned from the roads from 01:00 to 06:00. Any vehicles on the roads during that time had to follow special rules. All vehicles had to come to a complete stop at 04:50, then carefully change to the right-hand side of the road and stop again (to give others time to switch sides of the road and avoid a head on collision) before being allowed to proceed at 05:00. In Stockholm and Malmö, however, the ban was longer — from 10:00 on Saturday until 15:00 on Sunday — to allow work crews to reconfigure intersections. Certain other towns also saw an extended ban, from 15:00 on Saturday until 15:00 on Sunday. The relatively smooth changeover saw a reduction in the number of accidents. On the day of the change, only 157 minor accidents were reported, of which only 32 involved personal injuries, with only a handful serious. On the Monday following Dagen H, there were 125 reported traffic accidents, compared to a range of 130 to 198 for previous Mondays, none of them fatal. Experts suggested that changing to driving on the right reduced accidents while overtaking, as people already drove left-hand drive vehicles, thereby having a better view of the road ahead; additionally, the change made a marked surge in perceived risk that exceeded the target level and thus was followed by very cautious behaviour that caused a major decrease in road fatalities. Indeed, fatal car-to-car and car-to-pedestrian accidents dropped sharply as a result, and the number of motor insurance claims went down by 40%. These initial improvements did not last, however. The number of motor insurance claims returned to ‘normal’ over the next six weeks and, by 1969, the accident rates were back to the levels seen before the change. By the time Collapsible Boat D was launched at 2:05 a.m., there were still 1,500 people on board Titanic and only 47 seats in the lifeboat. Crew members formed a circle around the boat to ensure that only women and children could board. Two small boys were brought through the cordon by a man calling himself “Louis Hoffman”. His real name was Michel Navratil; he was a Slovak tailor who had kidnapped his sons from his estranged wife and was taking them to the United States. He did not board the lifeboat and died when the ship sank. The identity of the children, who became known as the “Titanic Orphans”, was a mystery for some time after the sinking and was only resolved when Navratil’s wife recognised them from photographs that had been circulated around the world. The older of the two boys, Michel Marcel Navratil, was the last living male survivor of the disaster. First Class passenger Edith Evans gave up her place in the lifeboat to Caroline Brown, who became the last passenger to enter a lifeboat from the davits. Evans became one of only four First Class women to perish in the disaster. In the end, about 25 people were on board when it left the deck under the command of Quartermaster Arthur Bright. Two first class passengers, Hugh Woolner and Mauritz Håkan Björnström-Steffansson, jumped from A-Deck (which had started to flood) into the boat as it was being lowered, with Björnström-Stefansson landing upside down in the boat’s bow and Woolner landing half-out, before being pulled aboard by the occupants. Another first class passenger, Frederick Maxfield Hoyt, who had previously put his wife in the boat, jumped in the water immediately after, and was hauled aboard by Woolner and Björnström-Steffansson. The number of people on board later increased when about 10–12 survivors were transferred to collapsible D from another boat. 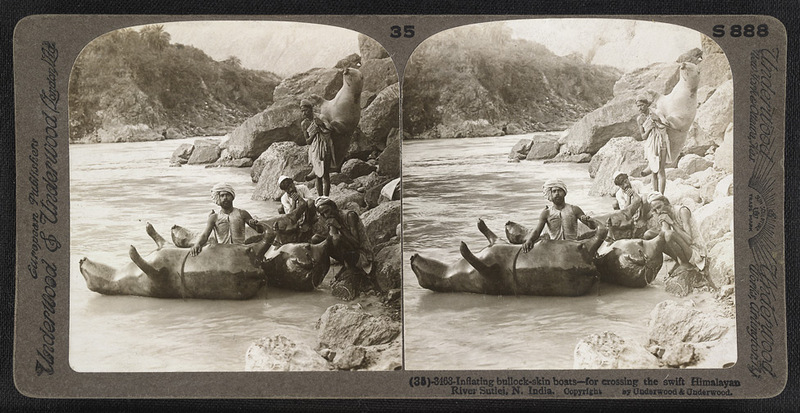 Carpathia picked up those aboard collapsible D at 7:15 a.m.
Stereoscopic photograph of inflated bullock skin boat, or dreas, at the side of the river Sutlej, in Himachal Pradesh, taken by James Ricalton in c. 1903, from The Underwood Travel Library: Stereoscopic Views of India. 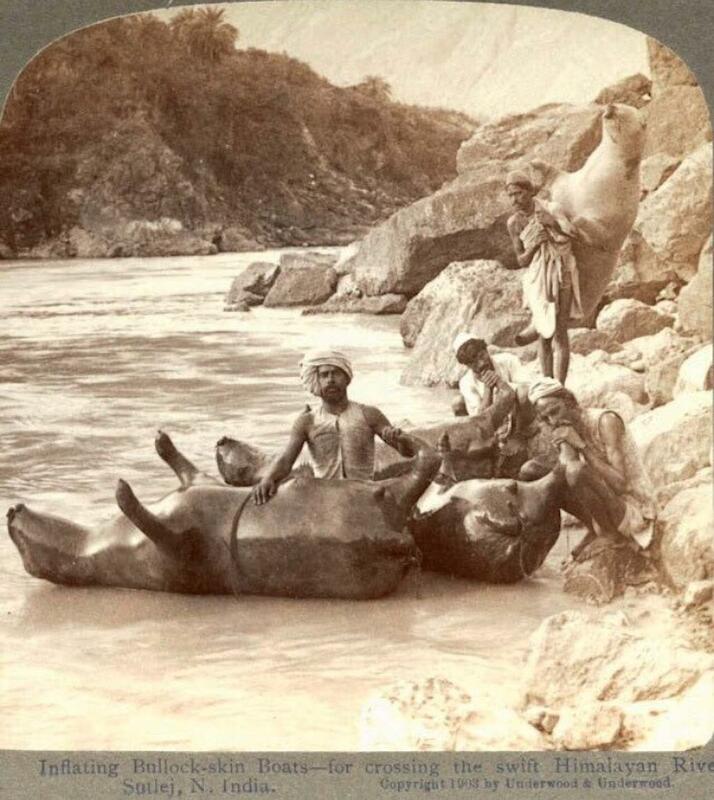 This image is described by Ricalton in ‘India Through the Stereoscope’ (1907): “I have crossed the river several times on these inflated bullock-skins…The drea-man, after inflating the skin as you see them doing here, places it on the water and places himself on his stomach athwart the skin with his feet in the water; he holds a short paddle in his hands. The intending passenger sits erect, astride the drea-man…You have observed how the skin for this purpose is taken from the animal in one piece and how all openings in the skin are closed except in one leg which is kept open for inflation…These drea-wallahs can drive the skins across the river during high floods when the best swimmer would be helpless in the powerful current.” One of a series of 100 photographs that were supposed to be viewed through a special binocular viewer, producing a 3D effect. The series was sold together with a book of descriptions and a map with precise locations to enable the ‘traveller’ to imagine that he was really ‘touring’ around India. Stereoscopic cameras, those with two lenses and the ability to take two photographs at the same time, were introduced in the mid 19th century and revolutionised photography. They cut down exposure time and thus allowed for some movement in the image without blurring as subjects were not required to sit for long periods to produce sharp results.